1) Heat a frying pan. 2) put oil into the pan and heat it. 3) Add urad dal, channa dal, mustard seeds, red chillies and stir fry. 4) Add the grated carrot to it. 5)Mix it well and add green chillies. 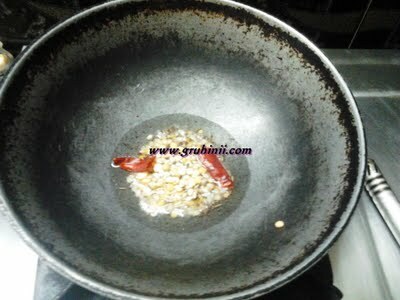 6) Add haldi and salt to taste, mix and close with lid, cook for 10 minitues in a medium flame. Mix at intervels. When it is properly cooked , remove the curry into serving bowl and garnish with dhaniya leaves, lemon or with green chilles etc. Before serving squeeze the lemon and mix with the content and eat with chapatis / rotis..